The latest survey from George Mason University’s Center for Climate Communication reveals that the number of Americans “very worried” about global warming has reached a record high since first measured in 2008. A majority of Americans (63%) say they are “very” or “somewhat” worried about the issue. 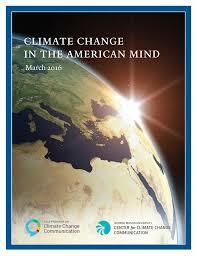 Likewise, Americans increasingly view global warming as a threat. Since Spring 2015, more Americans think it will harm them personally, their own family, people in the U.S., people in developing countries, and future generations. You can read the full survey report here. Virginia Commonwealth University (VCU) hosted the Energy and Sustainability Conference in January 2013. The two-day event was organized by Virginia Sustainable Building Network and James River Green Building Council. More than 800 attendees heard national leaders across business and institutional market sectors discuss how sustainability is changing their organizations and how they’re adapting and leveraging sustainability to enhance their business results. Click here to view the archived event website. These Institutional Building case studies from the SBRD/VSBN archives focus on green building projects in our region. Case studies are available in Adobe® PDF format, and are provided courtesy of the former Sustainable Building Resource Directory (SBRD) and Virginia Sustainable Building Network (VSBN). Browse our archived website from this event to review the Agenda, Speaker List, Sponsors, and more. Add your email address below to get news and notifications from Resilient Virginia. Earth Day 5K Race Without a Trace and Party for the Planet. Find out more and register at: www.viridiant.org/events. Location: Kenmore Middle School, 200 S. Carlin Spring Rd, Arlington, VA. Location: Omni Nashville Hotel | Nashville, Tenn.
Food waste highlighted in this video.